My wife, Bev, and I just got back from a week long road trip through Georgia. We had a wonderful time: the people of Georgia are warm and gracious, the landscape is lovely, and there’s good food – and a rich culinary heritage – wherever you go. My radar, of course, was trained on the pies and other baked goods along our route. Georgians, it is abundantly clear, love their sweets which – unsurprisingly – often include the state’s premier culinary treasures, peaches and pecans. 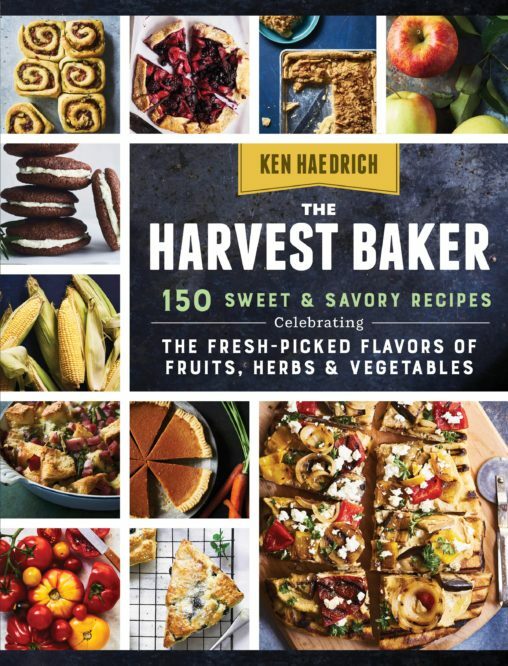 The latter show up in more clever ways than you can imagine: in fish breading, on glazed chicken, in salads with blue cheese, and – naturally – in pie fillings and toppings, in and on layer cakes, and bread puddings. Indeed, I feel like I’ve been pecan-ed to death this week. But in a good way. 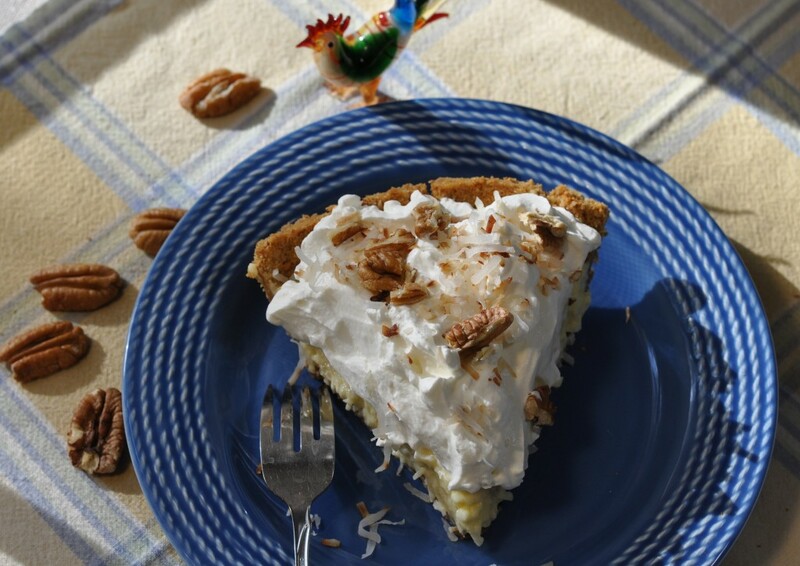 My immersion in pecan cuisine inspired me to add a couple of Georgia touches to our featured pie this week – coconut cream pie. I’ve scattered pecans on top, for an attractive garnish. And I’ve included finely ground pecans in the graham cracker crust, lending an unmistakeable nuttiness. I love the flavor. And it’s a fitting tribute to a state that doesn’t shy away from down home, traditional American baking. Making a crumb crust may be simple, but I think it makes a big difference – and shows you care – if you take your time and do it right. By “right” I mean trying to make the entire crust uniformly thick, including the top edge. The best way to do this is to spread the crumbs around as evenly as possible, including up the sides, before you start pressing. Try it and see if you don’t agree. In case you’re wondering about Joe Licata – the fellow who shares top billing in the title – he’s my brother-in-law. 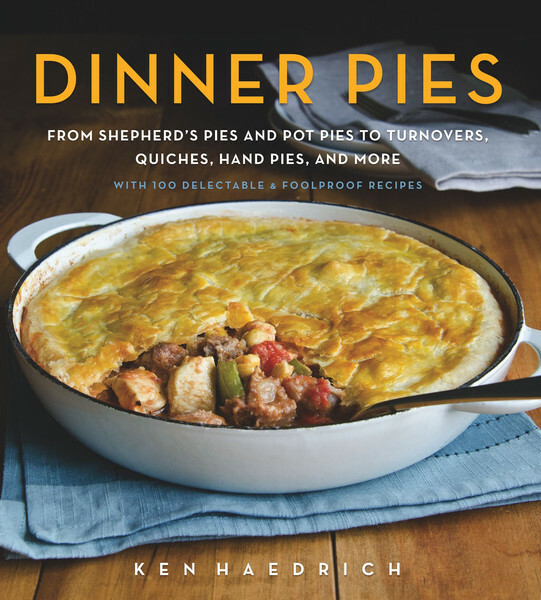 Joe’s a great guy and incredibly talented home builder – not a pie maker, mind you, but an expert on diner food. 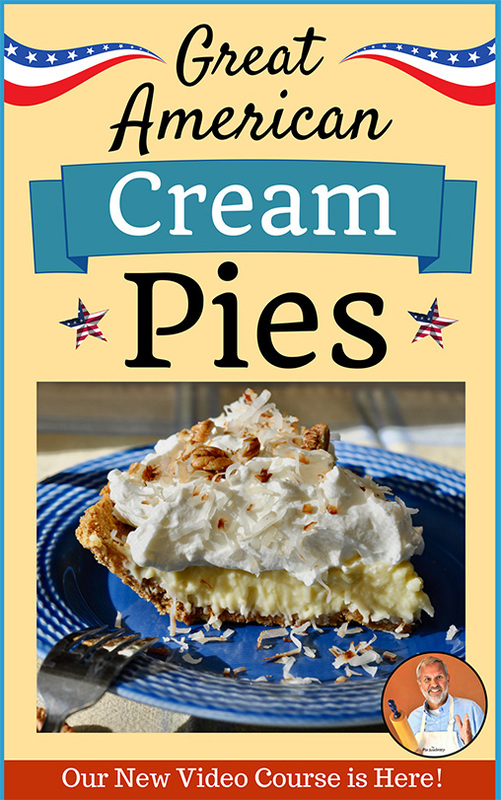 He says this is the best coconut cream pie he’s ever eaten. 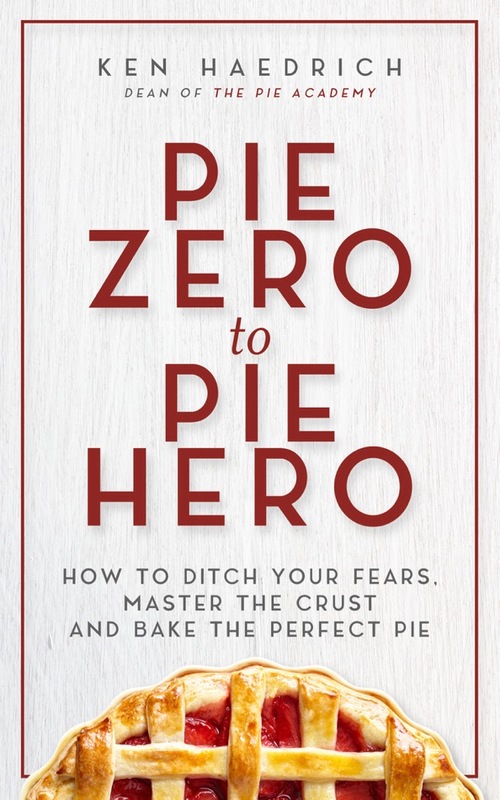 How could you not name a pie for a guy who paid you that sort of compliment? Incidentally, if you can’t get to Georgia but you’re looking for good pecans from the source, we stopped at a place called The Orchards in Wrens, Georgia where they sell pecans by the pound and by the box, not to mention all sorts of delicious pecan confections. Nice place, and friendly people. If you like, you can visit them online at TheOrchardsGourmet.com. TO MAKE THE PECAN CRUST, combine the pecans, sugar, and flour in the bowl of a food processor and pulse the mixture until the nuts are finely ground. Transfer to a large bowl and mix in the graham cracker crumbs and salt. Add the melted butter and mix well with a large fork. Drizzle 2 teaspoons water over the mixture and then rub the mixture with your fingers until it is well combined and slightly clumpy. Preheat the oven to 325°. Butter the bottom (but not the sides) of a 9 1/2" deep-dish pie pan. 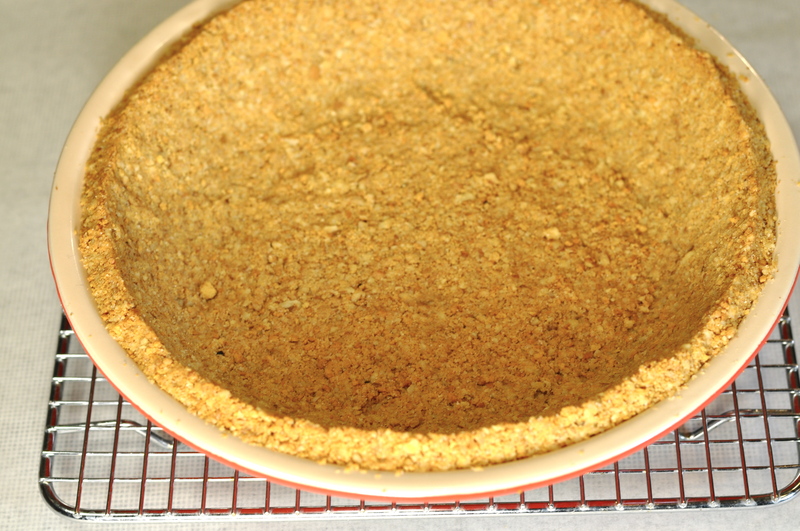 Add the crumbs and spread them evenly across the bottom and up the sides. Press evenly into the pan. Bake the shell on the center oven rack for 10 minutes. Transfer to a cooling rack and cool thoroughly. TO MAKE THE FILLING, whisk the sugar, cornstarch, and salt together in a medium size, heavy saucepan, preferably nonstick. Whisk in the milk (or half-and-half) and yolks. Place over medium heat and cook, whisking almost nonstop until the mixture thickens and starts to boil - about 5 to 7 minutes. Go easy, and don't try to make it boil too quickly. 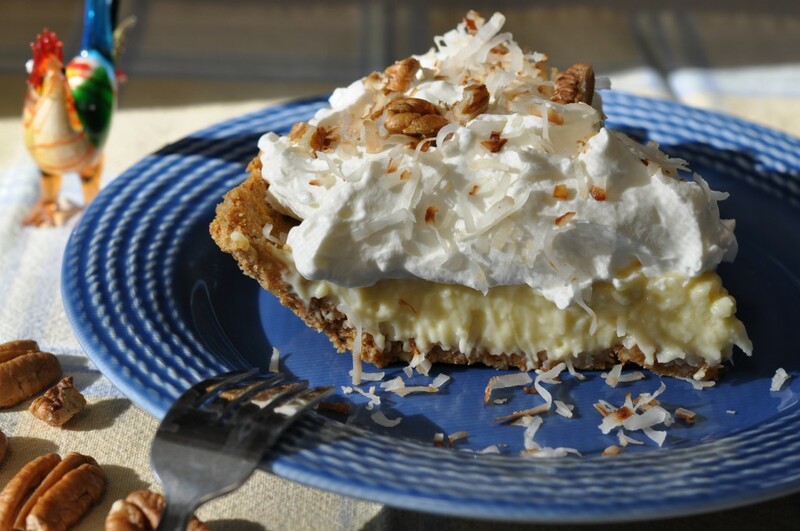 Remove from the heat and whisk in the butter, one piece at a time, vanilla, coconut extract, and coconut. Pour the filling into the pie shell and smooth with a spoon. Place a piece of plastic wrap over the filling so it doesn't form a skin. Transfer the pie to a rack and cool thoroughly. Refrigerate overnight. TO MAKE THE TOPPING, put the coconut and chopped pecans in a skillet over medium-low heat and toast, stirring virtually nonstop, for 3 to 5 minutes, until the coconut takes on a golden hue. Watch it carefully; it burns easily. Quickly transfer to a plate and cool completely. About 10 minutes before you plan to serve the pie, chill a bowl and your electric mixer's beaters for 5 minutes. Pour the cream into the cold bowl and beat until it holds soft peaks, then beat in the confectioners' sugar. Add the vanilla and beat until the cream is firm but not grainy. 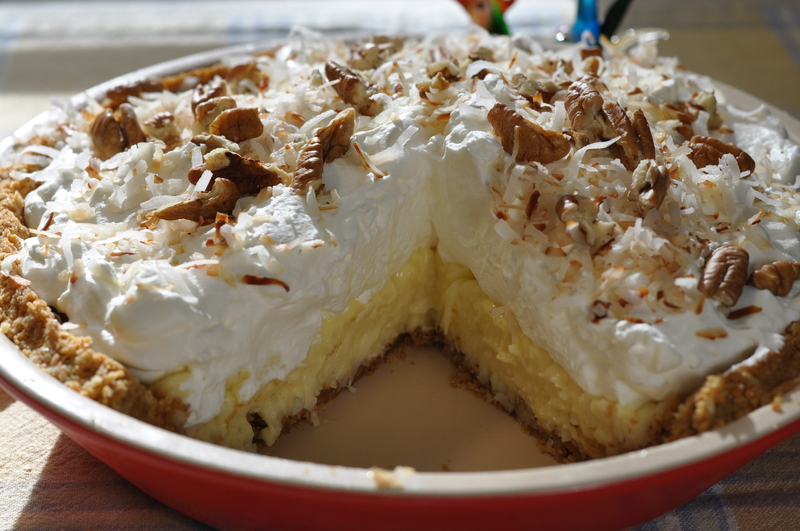 Spread the whipped cream over the pie then sprinkle the top with the cooled coconut and pecans. Makes 8 to 10 servings.